Many people enjoy healthy vegetarian pasta dishes whether they are vegetarians or not. Pasta is adaptable, familiar, and versatile, which makes it a comforting choice—especially for new vegetarians. If you're cooking for a mixed crowd, you can always cook a portion of meat separately to be added later. Here are some fantastic vegetarian pasta recipes—some are more traditional and inspired by Italian food, while others are unique and unusual. 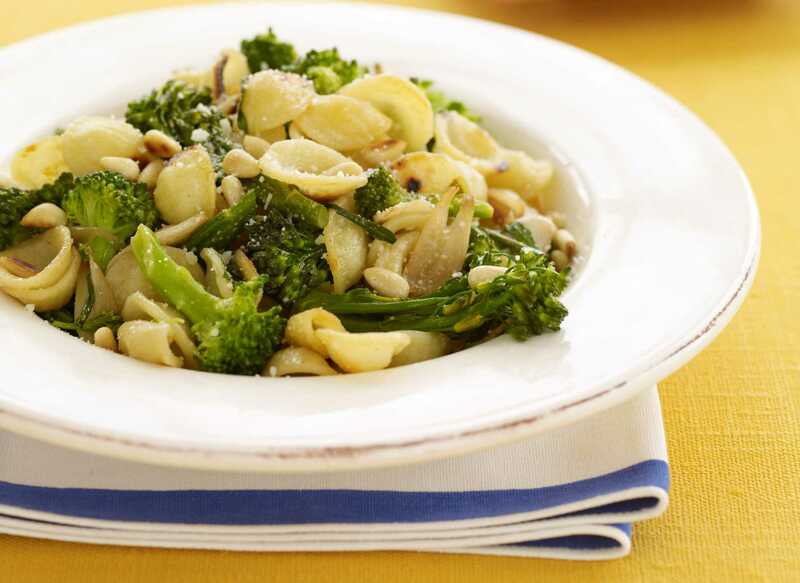 Steam some broccoli, toss with lemon and pine nuts, top it all off with some fresh Parmesan cheese, and you've got yourself a complete vegetarian pasta dinner. Quick, simple, nourishing, and fast—a perfect vegetarian pasta that is sure to please the whole family. Originally made with anchovies, this vegan version stays true to the recipe by including salty capers to create a similar taste—a little bit of olive brine doesn't hurt either. These two ingredients are added to the canned crushed tomatoes, along with kalamata olives, garlic, fresh basil, and red pepper flakes. The sauce is tossed with your favorite shaped pasta and you are suddenly transported to the Italian countryside. Adding sun-dried tomatoes and artichoke hearts to a pasta dish always seems to transform an ordinary recipe into something special. Despite the elegance of the final dish, the ingredients—including fresh basil, garlic, black olives, and red peppers—are simple, making this an easy and healthy vegetarian meal that will wow any dinner guest. This great basic meatless pasta dish is just waiting to be personalized with your favorite vegetables, or whatever you have on hand. This recipe includes spinach, but another leafy green or some tomatoes would work just as well. Just add milk or soy milk, ricotta cheese, and pasta. It may seem odd to add avocados to a warm pasta dish, much less to a pesto pasta. But this California-style healthy pesto pasta with pine nuts and Parmesan cheese is tasty and easy to make. Simply blend the pesto ingredients in the food processor, toss with pasta, and then add the avocado. We are all familiar with a traditional pasta primavera, but did you know it can be made vegan? This recipe swaps out butter and milk for nutritional yeast and soy milk, maintaining the signature creaminess without the dairy. Load up on the veggies to make this a super healthy pasta primavera. Rather than the usual red pasta sauce, this vegetarian pasta dish combines a simple lemon and olive oil dressing with flavorful ingredients, including black olives, feta cheese, artichokes, and cannellini beans. Kids will love this recipe, and with plenty of fiber and protein, it's a nutritious choice for vegetarians. Since this recipe begins with a box of mac and cheese, it may not exactly fit into the "healthy vegetarian," but it turns what is usually an un-nutritious dish into one that has quite a bit of protein due to the added tofu. This recipe is kicked up a notch with the flavors of the southwest, but it's still familiar enough that even the pickiest of vegetarian kids will enjoy it. We may not think of lasagna as healthy considering it's usually layered with meat sauce and lots of cheese. But these lasagna recipes have the advantage of being vegetarian, and while it may not eliminate the cheese, it does add some veggies. Lasagnas filled with spinach, eggplant, sweet potato, and even pumpkin will bring nutrition to what is often an empty-calorie dish.